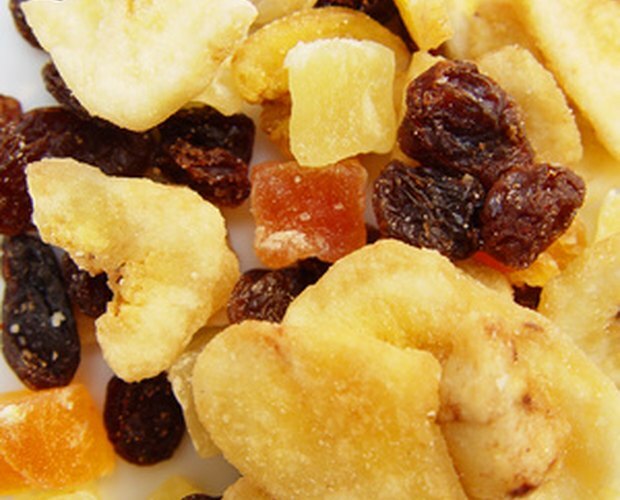 Dried fruit is a tasty, nutritious, and versatile snack, packed with vitamins and minerals. You can dry most fruit with just a little effort. Once you're done, throw on a little powdered sugar, and you'll have a sweet and delicious treat. Preheat the oven to 140 degrees F. If your oven doesn't go as low as 140 degrees, set the oven to the lowest setting and leave door slightly ajar. This is not recommended if you have children in the home. Clean the fruit thoroughly to remove any dirt or insects. Be sure to check for any damage or blight because such fruits will not dry properly. Remove any pieces of the fruit you don't wish to eat. For example, remove the stem and leaves of a strawberry before placing into the oven. Cut out cores, and then cut the fruit into thin slices or strips. For bananas, the best shape is a coin. Pretreat the fruit. This prevents the fruit from browning when exposed to air. 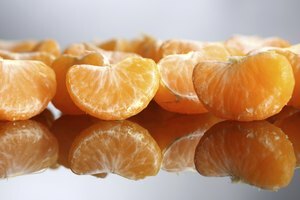 Ascorbic acid or Vitamin C prevents browning. Dip the fruit into a fruit juice high in vitamin C, such as orange or lemon juice. Coat the fruit thoroughly. If you prefer, you can use pure Vitamin C in tablet form; mix one (3,000 mg) tablet in 2 cups water, then apply to the outside of the fruit. Spray a baking pan with nonstick spray. Arrange the fruit pieces so that they are not touching one another. Place the tray into the oven. 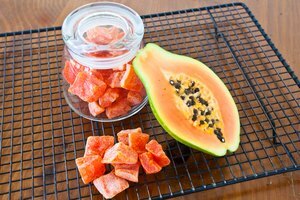 Allow 6 to 36 hours for fruit to dry, depending on the size of the slice and the type of fruit. Apples, bananas, and figs require between 6 and 8 hours, while peaches, pears, berries, nectarines, and nectarines take between 24 and 36 hours. Remove the fruit from the oven and cool. Check the moistness of the fruit by cutting in half. No moisture should be visible. If moisture is still visible, return the fruit to the oven and check again regularly. 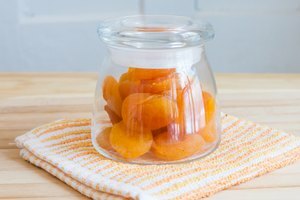 Condition (evenly distribute the remaining moisture) the fruit by placing it in plastic or glass jars that can be sealed. Let the fruit stand for 7 to 10 days. The excess moisture in some pieces will be absorbed by the dryer pieces, creating uniformly dried fruit. All fruits dry at different rates. Make sure to check the fruit regularly; you don't want them to dry to the point of brittleness.